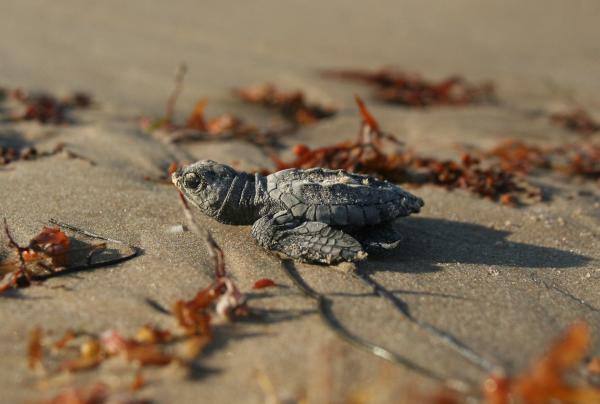 Facts about Kemp's ridley sea turtles including their habitat, diet, threats, and more. Until recently, the endangered Kemp’s ridley turtle was on the brink of extinction in the 1960's. Thanks to strict protection laws which protected their nesting beaches in Mexico and reduced accidental capture in fishing gear, the species has begun a slow, but steady comeback from a previous low of only 200 nesting individuals in the 1980’s, to an estimated 7,000 - 9,000 individuals today. These are the smallest of the seven sea turtle species, weighing between 75-100 pounds (35 - 45 kg) and measuring approximately 2 feet (.6 m) in length. This is the only species that nests primarily during the day. They also nest in mass similar to their relative the olive ridley (also known as an arribada). They possess a triangular shaped heads with hooked beaks and strong jaws. They inhabit nearshore habitats where they forage for their favorite prey, crabs. They also eat fish, jellies, shrimp, and a variety of molluscs. Learn more about their diet. They are considered Critically Endangered around the world by the IUCN Red List and listed as Endangered in the US. Kemp’s ridleys reach sexual maturity between 10-15 years of age which is significantly younger than most of the other species. Their scientific name is Lepidochelys kempii. In the US, these turtles are found in the Gulf of Mexico and along the Atlantic coast as far north as Nova Scotia. The primary nesting grounds in Mexico are at Rancho Nuevo, in the state of Tamaulipas, and in Texas along the Padre Island National Seashore. A small number have also nested further north along the Texas coast. However, 95% of all nesting occurs in Mexico in the state of Tamaulipas. Their population today is a fraction of the population recorded in the 1940’s. The demise of the population is attributed to human interactions, including the hunting for their meat and eggs. Entanglement in fishing gear also poses an enormous threat for this species. Bottom trawling, longline, and gillnet fisheries are all responsible for a large number of deaths every year. In 1947 an arribada of more than 40,000 Kemp’s ridleys was filmed at Rancho Nuevo, Mexico. In the mid-1980’s a low of around 700 nests were documented on these same beaches. Since then, the population appears to be recovering thanks to the protection of nesting beaches and the use of Turtle Excluder Devices on commercial trawlers. They are named after Richard Kemp, a fisherman from Key West, Florida, who helped discover the species. We're a non-profit organization that protects sea turtles through conservation travel and volunteer tours, educational programs, and Billion Baby Turtles.